A committee of wildlife experts warned Monday that Canada's largest land predator, the polar bear, was at risk of disappearing from its vast Arctic landscape as melting Arctic sea ice makes hunting prey a challenge. "It is clear we will need to keep a close eye on this species," Graham Forbes, co-chair of the Committee on the Status of Endangered Wildlife in Canada (COSEWIC) said in a statement. "Significant change is coming to its entire range." He explained that the bears use sea ice and the "same sit-and-wait techniques familiar to ice fishers" to hunt seals for food. Predictions of longer ice-free Arctic summers will make hunting "much more difficult" for polar bears, he said. Inuit, however, are cautiously optimistic the bears will adapt. In its latest assessment, COSEWIC incorporated both science and Inuit knowledge. It concluded that "while not currently threatened with extinction, the species faces an uncertain future." Its status was listed as a Special Concern, meaning it may become threatened or endangered. Canada is home to two-thirds of the world's polar bear population. 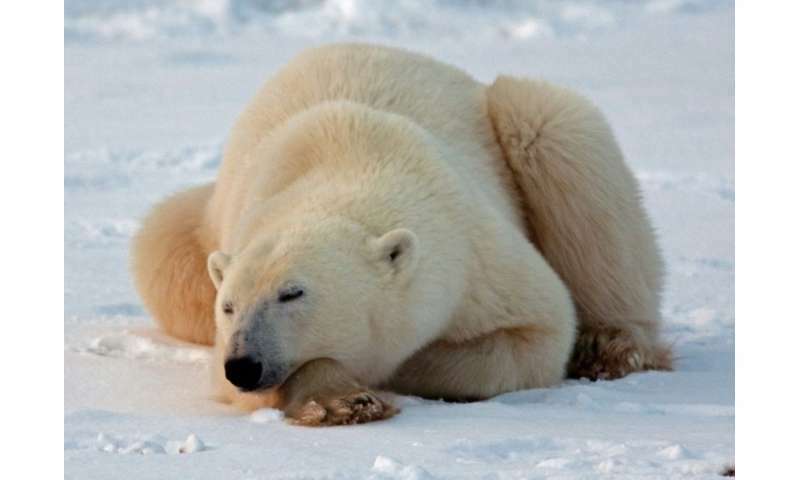 At last count in 2011, there were 15,500 polar bears in Canada. The same year, Ottawa listed the animal under its Species at Risk Act, requiring a conservation strategy be put in place to alleviate human threats to the iconic bears. COSEWIC also expressed concerns about declining Chinook salmon stocks along the Pacific coast, and Black Ash after two billion of the trees in the Great Lakes region were killed by Emerald Ash Borer beetles. Do polar bears primarily hunt when the ocean is frozen over ir in the summertime after the ice breaks up? Google it. Polar bears primarily hunt on the sea ice for various seals at their breathing holes and resting haulouts in or on the ice during the winter. Summer is a lean time for them, when they subsist on whatever they can catch or find, including rotten blubber from weeks dead carcasses. During the late summer and early autumn when there is no sea ice and they can't get seals, they may go a month at a time without eating and survive on their own blubber, losing hundreds of pounds. Now, did you have a point? Reported for an offensive handle. We'll see if the moderators do anything about it.